Cloudy skies. High 56F. Winds NNW at 15 to 25 mph. Higher wind gusts possible.. Some clouds early will give way to generally clear conditions overnight. Low 39F. Winds N at 10 to 20 mph. Control tactics targeting different “choke points” influence the long-term success or failure of a weed. Editor’s note: The following was written by Bob Hartzler, Iowa State University professor of agronomy and Extension weed specialist, for the Extension Integrated Crop Management blog Dec. 13. 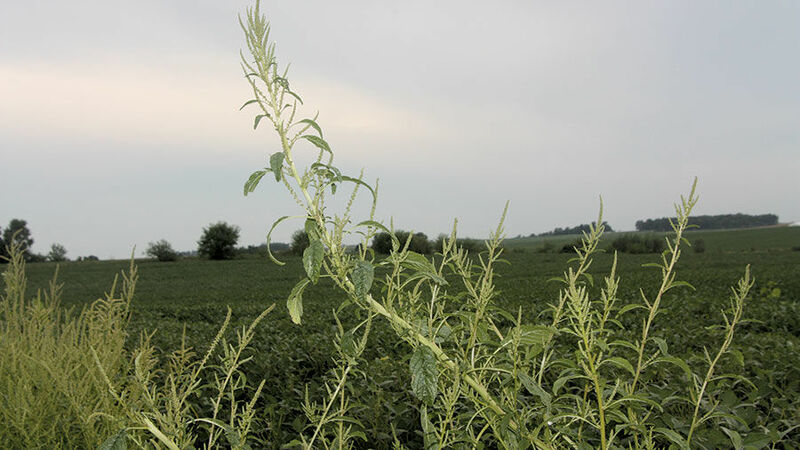 While herbicide resistance is not a new issue, the rapid increase in multiple resistant biotypes in waterhemp, giant ragweed and horseweed (marestail) is limiting herbicidal options. A waterhemp biotype resistant to six herbicide groups (2, 4, 5, 9, 14 and 27) was recently identified in Missouri. The majority of Iowa fields have waterhemp resistant to three herbicide groups, and five-way resistant populations have been found. While herbicides will remain the backbone of weed management systems for the foreseeable future, it should be clear that additional tactics are needed. This article focuses on alternative strategies that fit our current cropping system, with an emphasis on harvest weed seed control. While none are as easily adopted as changing herbicide programs, they will be essential for preserving herbicides as effective management tools. Summer annuals are the dominant weed problem in the corn-soybean rotation since these pests establish and mature at the same time as the crops. 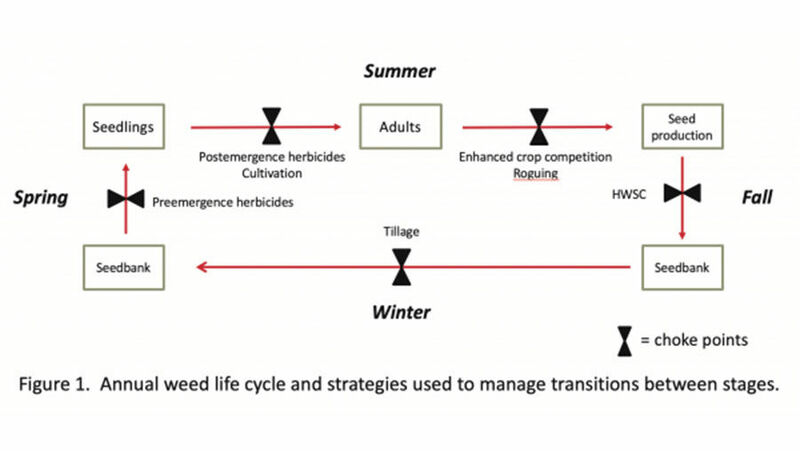 The annual life cycle has several distinct stages, and the success at transitioning between these stages determines whether a weed increases or decreases within a field. Population dynamic models allow researchers to investigate how control tactics targeting different “choke points” influence the long-term success or failure of a weed. Current weed management programs primarily target weeds as they emerge from the seed bank (preemergence herbicides) or as they develop from seedlings (postemergence herbicides). While these tools are highly effective, the increase in herbicide resistance raises concern regarding their sustainability. Population dynamic models reveal that weeds are very sensitive to changes in the number of seed that enter the seed bank, thus tactics that reduce seed production or their entry into the seedbank have a large impact on the long-term success of the weed. A population model evaluating the benefit of harvest weed seed control (HWSC) in delaying the onset of resistance showed that destroying approximately 50 percent of weed seed at harvest delayed resistance evolution by nearly 10 years. Preventing seed produced by weed escapes from entering the seed bank is an effective approach to weed management. The first mechanized combines often were equipped with weed seed collectors to prevent weed seed from being returned to fields. Walking beans was a rite of passage for generations of Iowa farm kids. However, with the introduction of modern herbicides and increases in farm size, these tactics have fallen out of favor. HWSC is one of the few alternatives to herbicides that can be incorporated within Midwest states’ production systems without significantly increasing labor requirements. The interest in HWSC has been driven by Australia’s struggle with herbicide-resistant weeds. Western Australia is recognized as the herbicide-resistant weed capital of the world due to the widespread occurrence of multiple resistant weeds. The loss of effective herbicides for several important weed species, especially annual ryegrass (Lolium rigidum) in wheat production, has forced the development of innovative approaches to managing weed seed before they enter the seedbank. A survey of Australian farmers in 2014 found 82 percent of respondents expected to use some form of HWSC within five years. Australians have developed several HWSC techniques, including chaff carts, baling of crop residues, chaff tramlining, narrow-windrow burning and weed seed destruction. Probably most applicable for Midwest cropping systems are chaff mills, devices that destroy weed seed during harvest. Chaff, which contains the majority of weed seed, is separated from other plant material as it moves through the combine. The chaff is run through a rolling cage mill that damages seed sufficiently to render them non-viable. The original design, the Harrington Seed Destructor, was a separate unit pulled behind the combine. More recently, chaff mills are integrated into the back of the combine. Factors that influence the effectiveness of chaff mills are how long seed are retained on weeds and the ability of the mill to destroy seed. Seed retention varies widely among species. Chaff mills or other forms of HWSC would have little value for managing giant foxtail since most seeds fall from plants prior to harvest. Weed scientists at the University of Illinois found that 72, 92 and 95 percent of waterhemp seed remained on the plant at the time of soybean harvest in three years of research (A.S. Davis, unpublished data). The value of HWSC for waterhemp would be diminished in years with late harvest, such as in north central Iowa in 2018. Tests with a wide range of weed seeds have shown that greater than 95 percent of seed entering the mill is rendered non-viable, thus retention on the plants is the limiting factor in the effectiveness of this tactic. Early versions of chaff mills cost approximately $120,000, but people estimate that with mass production, the cost could be reduced by at least 50 percent. Several factors pose challenges to this technology. Current versions require approximately 80 to 100 horsepower — this power drain can result in a 12 to 20 percent reduction in combine capacity. The increased power requirement associated with weed seed destruction results in an average increase in fuel consumption of 0.4 of a gallon per ton of grain. Currently there is limited experience using the chaff mills in corn or soybean, thus it is unclear how well they will perform in our system. Green stems of crops and weeds negatively impact mill performance, frequently blocking flow of the chaff through the mill. Another issue with the chaff mills has been rapid wear of the mill components. Manufacturers estimate rotors should have a usable life of 800 hours, but most Australian owners of the equipment report lives of less than half that. Replacement cost for rotors is more than $2,000. The low cutting height of soybeans probably would reduce the lifespan of rotors more than when harvesting corn due to greater amount of soil on the soybean residue. At this time, most Iowa farmers would not consider weed management a big enough problem to warrant the expense and inconvenience of adopting HWSC. Australia’s farmers went this route only after weeds developed resistance to nearly all herbicides available for their cropping system. The increasing pace of herbicide resistance evolution and the slow introduction of new herbicide sites of action suggest we will face the same dilemma in the not-too-distant future. To prevent further loss of effective herbicides, attitudes towards weed management need to change. Reducing the size of the weed seedbank must be viewed as just as important as protecting crop yields. There are several issues with HWSC that limit its utility in our system at this time. However, it is important to recognize this is new technology for which the bugs are being worked out. Weed problems are severe enough in Australia that many farmers are willing to tolerate the problems associated with the equipment.